As many of you likely know, not only was Rick the primary earner in his home, he prided himself on being a provider and a caretaker, and it was his honor to sacrifice for the good of his family and the ones he loved. The N. R. Peterson Memorial fund is being set up as a way to continue Rick’s commitment to his family by helping to defray the expenses for those left behind who relied on him. It is an unfortunate reality that his wife does not have the ability to work anymore and thus relied on Rick financially (and in many other ways as well). This is the sole purpose of the fund, to help ease the financial burden to her of this sudden loss. The fund will be overseen by Rick’s son Michael but will go 100% to Shawne’s household expenses. Any donations are very much appreciated, as is any other way in which you may wish to honor and remember Rick. If you do memorialize Rick in some other manner and are comfortable sharing, please let us know! We want to celebrate his life with you, and the comments on this page are specifically for that purpose. 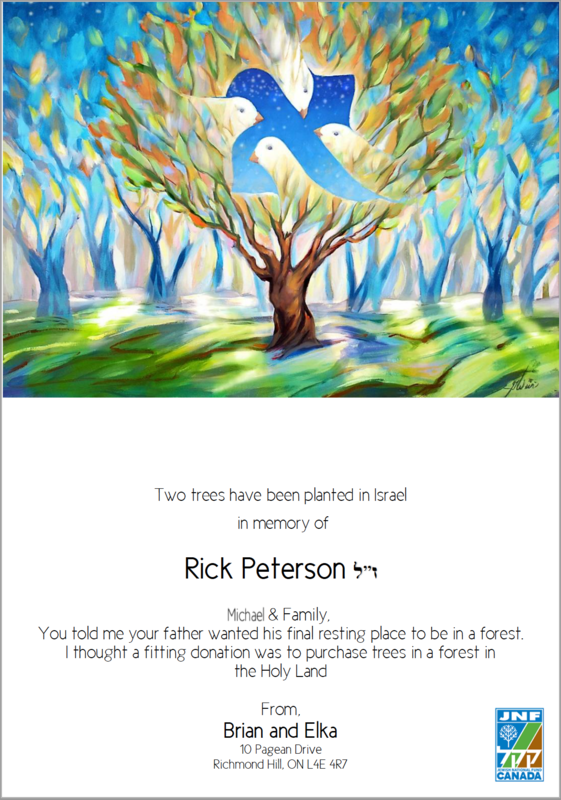 We would like to share with you one creative and kindhearted way in which Rick’s memory has been honored by friends of Michael’s, Brian and Elka Birnbaum. They remembered that Rick had originally wanted his remains to be donated to a forensics research area (a body farm), but was not accepted, so they chose to remember Rick by planting two trees in his name. We are so grateful to the Birnbaum’s for this gift, and feel it was an extremely fitting and very personal tribute. Thank you very much for taking the time to read this. In these times of heart wrenching grief, it is comforting to know our father, husband, and brother is being remembered and honored by others as well. The “goal” is really an arbitrary setting that DonorBox made us pick, but our goal is to help Shawne the best we can.